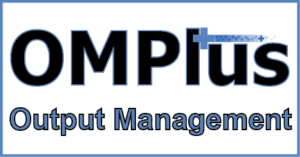 OM Plus Document Output Management Software from Plus Technologies OM Plus can solve many complex output management and document delivery challenges. Whether you just need to replace your operating system’s print spooler, or you have complex document delivery challenges, chances are your problem is listed here along with the appropriate solution provided by OM Plus’ advanced print spooling, print management and document delivery functionality. Your Problem: Managing and supporting a large enterprise’s print infrastructure is a complex task. As the person in charge of this critical business function, you know that it is a huge challenge to manage printers in different buildings, different plants, even different countries. You don’t know immediately when a printer is offline, jammed, out of toner or just swamped with too many print jobs. This lack of a single view of your enterprise print infrastructure leads to lost productivity at your company. Why You Need OM Plus: OM Plus provides remote status of your entire enterprise printing environment from a single screen. It allows you to easily re-print or re-route print jobs from wherever you happen to be. Your Problem: When a user sends a print job from the first floor, how do you know it printed on the sixth floor? What about print jobs that are created in Ohio and printed at the plant in Scotland? Do you know they printed? How long is it before your help desk finds out about a printing problem? Printing delays or stoppages negatively impact profitability throughout the company. Why You Need OM Plus: OM Plus provides Assured Delivery of your printing worldwide. OM Plus can communicate directly with the printer to receive information that tells you paper actually hit the output tray. Problems appear immediately on the OM Plus status screen and resolution can take place right away, many times before the end user or the application is aware of the problem. OM Plus can even be set to page or email you when a mission critical problem occurs. Your Problem: Do your users choose printers that are not appropriate for the job they are printing because the printer is close by? Do they print large jobs on printers designed for departmental printing? Would you like to be able to balance the load amongst printers automatically or route around failed, empty or jammed printers? This lack of print management and control consumes too many company resources (both support people and supplies). Why You Need OM Plus: OM Plus provides advanced print automation. It can control not only who can print to what printers, but can stop a user from printing 1000 page jobs to a desktop printer. OM Plus can also “round robin” print jobs to groups of printers to more evenly utilize the printers. Additionally, OM Plus can be set up to automatically re-route a print job that is intended for a printer that has failed. Your Problem: Is your WAN saturated with large print jobs which impact the performance of your WAN? Large print jobs can saturate a lower speed WAN connection on their way to the printer and then sit in the printer’s buffer to be printed at the rated speed of the printer i.e. hurry up across the WAN (use up lots of bandwidth) and then wait at the printer to slowly print. Are you concerned with security of the print data as it is being transmitted over your WAN? Why You Need OM Plus: OM Plus can “throttle” print streams that travel over your WAN to remote locations, resulting in less bandwidth “hogging” yet still maintaining rated printer output speeds. OM Plus can encrypt print streams between sites to protect the data on the WAN and encrypt it all the way to the printer, with some printer types. Your Problem: Do you know which printers are over utilized and which are under utilized? How much does it cost your company Help Desk to manage your company’s printers and print problems? Are all the statistics in one place? Managing an enterprise wide print environment is a Help Desk resource drain and OM Plus is a great tool to reduce that drain. Why You Need OM Plus: OM Plus provides remote statistics gathering and printer trouble isolation for companies around the world (Plus Technologies has thousands of installations). OM Plus allows the Help Desk to better manage print in the enterprise with a single view of all the company’s print. It allows printer grouping (independent of actual print servers) into manageable units and has allowed companies to reduce their print related trouble calls by as much as 50%. What would a reduction of 50% in print related calls to your Help Desk save your company? All This Without Changes to Your Application Being Required !